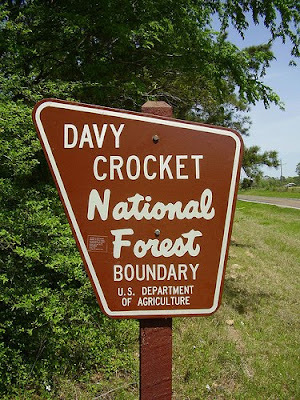 This past Saturday, I ran in the third annual Davy Crockett Bear Chase in Groveton, Texas. 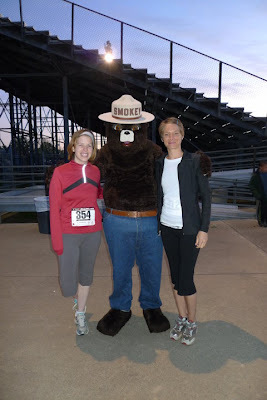 The Bear Chase features a 5K, a half marathon, and a full marathon - I opted for the half, which was a perfectly pleasant, fairly flat out-and-back course, mostly along a quiet country road and partly on a packed earth path through the forest. Groveton is about an hour and fifteen minute drive from Nacogdoches, so I got up at 4:15am, ate a bowl of homemade granola, and picked up Amy, who was also running the half (her second race and longest run ever!). We arrived with plenty of time to pick up our race packets, use the bathrooms, and pose for a photo with Smokey the Bear. The race was not very big - about 300 runners in all - and it started at 7:00am on the dot, which I appreciated. A local high school student sang the anthem and then we were off! 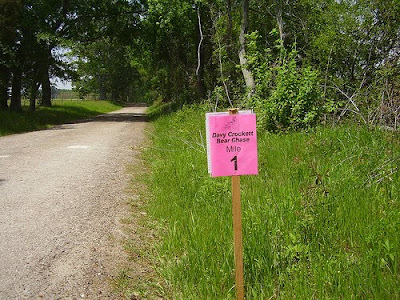 The race started at the high school track and the first mile was on packed gravel, which was a little tricky. There were aid stations every two miles and people were very friendly. 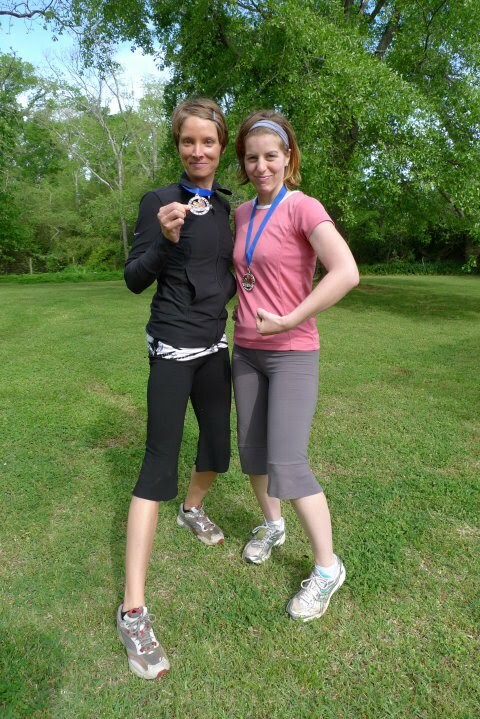 Amy and I ran the first half of the race together and we kept about an 8:30 minute per mile pace - my goal was to finish in under two hours, which required a 9:00 minute pace. But I felt so good - the weather was perfect, the race was small and laid back, and I was in a great mood - so I just went with it. We kept this pace until about mile 6, when we turned off the paved road and entered the forest. Miles 6-8 were the hardest for me! 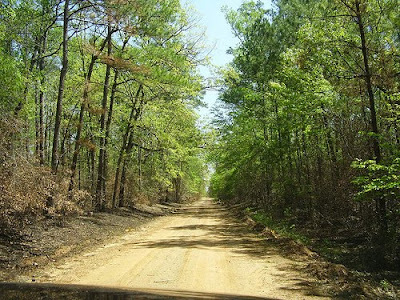 The forest trail was challenging, especially after an hour on nicely paved roads. My pace also started to catch up with me and I felt myself slowing down. Shortly after the turn around point, Amy started to inch ahead and I waved her on - we were ready to run our own races. 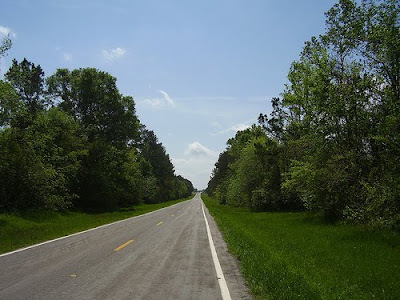 While the forest was beautiful, I was glad to get back to the road. 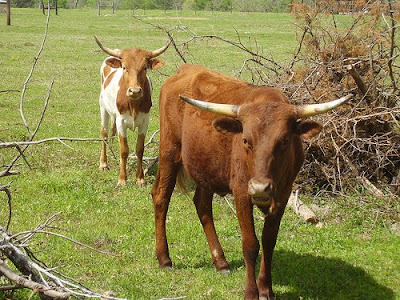 And while I thought the out-and-back course would be boring, it was actually really nice - I knew what to expect and really, after a while, all cows look the same. At mile 11, I saw Nathan standing on the side of the road! He had to back out of the race due to a foot injury, but he was healed enough to run about a quarter of a mile at my side. I excitedly told him that I was on target to finish in under two hours, and we high-fived. Then he and David (our official photographer) got back in the car and sped away so they could meet Amy and I at the finish line. The last two miles were brutal. I knew the end was near, but I felt myself slowing down anyway. So much for finishing strong! When I finally reached the high school, I had to run around the track before I was done. 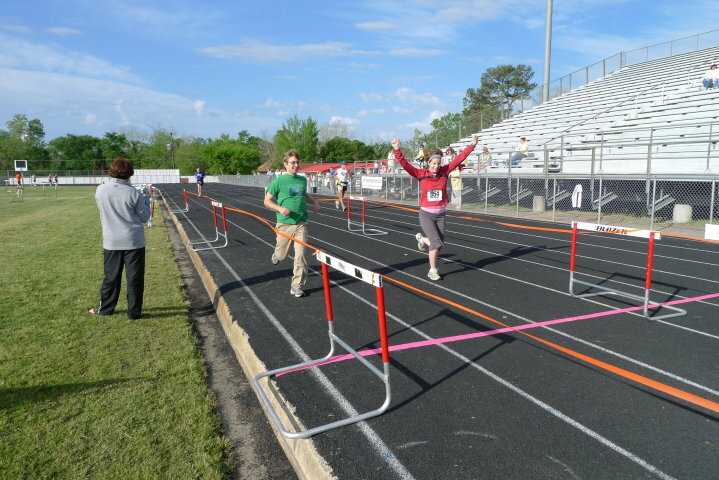 Nathan ran around the track with me, and when I finally crossed the finish line, I threw my arms up in the air - final time one hour, fifty-eight minutes, and twenty-one seconds. Mission accomplished! 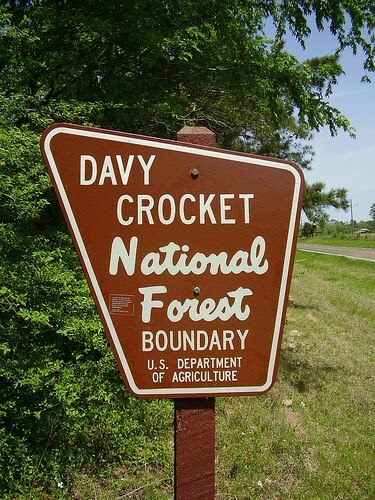 Verdict: The Davy Crockett Bear Chase is a great race - friendly, small and rural, featuring a beautiful (and beautifully flat) course, plenty of aid stations, sweet medals, and great after-race snacks. If we're still in Texas this time next year, I'll definitely be at the Bear Chase!